Wrong Way Round Sahara - Part Six: It's definitely left. Or right. 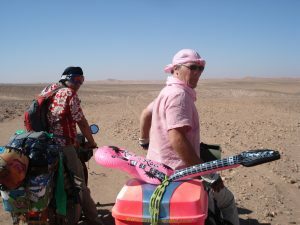 Wrong Way Round Sahara - Part Six: It's definitely left. Or right. A wrong turn is rarely more than an inconvenience. In the Sahara it’s the difference between reaching your destination or running out of water, dying a slow dehydrating death before being torn to pieces by hyenas and picked clean by vultures. So here we were standing at the “crossroads”, the one which the locals had given us stern warning about. The correct way would take us on to an oasis in the Erg Chigaga dunes where we could find shade and re-stock with food and water. The wrong way would take us into a barren no man’s land where we would likely get hopelessly lost. The trouble was, not one of us could now remember if they had said left or right. A few days ago we were stuck at 3,000 metres in the High Atlas mountains with a back tyre stuffed full of pants and socks as an emergency puncture repair. This debacle had cost us half a day and we still had over 200km to do to reach Zagora. This was the last place that we could make repairs, refuel and stock up with provisions before leaving civilisation for the mighty Sahara. 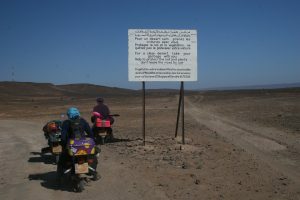 We decided if we got our heads down and motored we could reach Zagora before nightfall if we didn’t have any more problems. The first problem arose when Charlie’s bike decided to start dismantling itself. During a particularly rocky stretch, a bump too far caused the struts holding his top box to snap. Only the back wheel was holding everything up. Luckily we’d prepared for such an eventuality and without hesitation the gaffer tape and cable ties were deployed. Good as new. Nothing has prepared us for what came next. As we crested the rise of a hill the flat plains of the Sahara were stretched out before us and coming straight at us was – the Chergui, an arabic word which presumably means “shoving your head in an oven and sandblasting your eyeballs”. If Chuck Norris was a wind, he’d be the Chergui. long it took. Checking the map, we thought we could intersect a tarmac road some 50 or so miles further ahead. 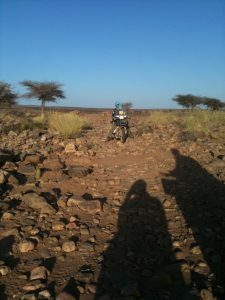 Thankfully our tactic worked and after a couple of hours we reached the main route down to Zagora which had the luxury of tarmac but with just enough potholes to make sure you couldn’t ride in a straight line or at a steady speed. A massive truck went past creating an angry swirl of dust and sand blasted us full in the face, went in our eyes, our throats, and seemingly removed the top layer of any exposed flesh. We pulled over and have a rethink. After thinking a bit, we carried on. After two more hours of squinting and ducking everytime a vehicle went past, our shed got that little bit closer to collapsing. It got dark. We now had a choice. Ride in the dark with sunglasses on, and end up in a pothole, or ride without sunglasses and have our corneas slowly shredded. A broken arm seemed preferable to blindness so we rode on in the dark with sunglasses. After all, Bono gets away with it. To our huge relief we saw the flickering lights of Zagora. Obviously a dodgy power supply. Still, all dust clouds have a silver lining. Zagora had a hotel, a bed, a shower and…what, noooo, you have got to be kidding?! The next morning we went down for breakfast. The hotel owner asked us if we’d slept well; “like a log“. He didn’t know what a log was but he could tell by our faces it was something good. “After eat you swim” he said. We didn’t know what swim meant so we just nodded enthusiastically as he led us out the back of the hotel. Our jaws dropped. Imagine a wall. On one side is nothing but a desolate dusty landscape of rock and the odd bush. On the other side is a lush manicured lawn, some decking, and… a swimming pool! If Elvis had been floating on a lilo we wouldn’t have been any more shocked. It’s a weird, weird feeling to be shivering and chattering your teeth when its nearly 50 degrees centigrade. Even though the water was warm, such was the difference in temperature with the outside air that it felt like a freezing cold bath. We dipped in and out of the pool, variously, boiling or freezing all at the same time. Bizzare. repaired. Mohamed Gordito is something of a legend in these parts. He had a big workshop in town full of bits of works rally cars which had met their end in the desert. The locals had no hesitation in suggesting we go there for repairs. Mr Gordito had never seen, let alone worked, on a Yamaha Townmate. But a fine job he did too. Once he’d stopped laughing. With everything sorted we sat down for what be our last proper meal for some time. It felt a little bit like being on death row, if death row is a cafe serving up freshly squeezed orange juice, grilled chicken and watermelon. With a final round of handshakes from the locals we made our way out of town passing the sign which tells you that Timbuktu is 52 days away as the camel plods. The considered view was that you avoided riding between 11am and 3pm when the sun was blistering, literally. There is a good reason why the Paris Dakar rally took place in January. 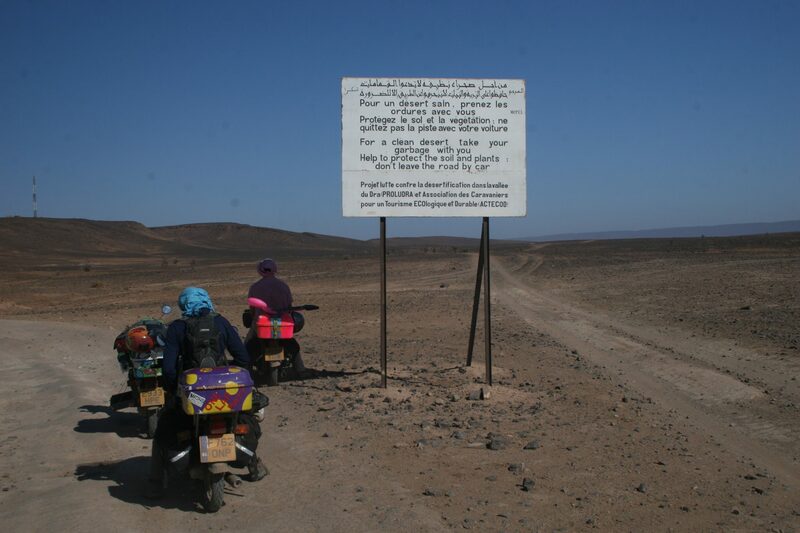 Before we’d even realised it, Zagora was lost in the heat haze and all that lay before us was desert. For the early stages we could at least follow the tracks used by the tourist 4×4’s but as we got further in the tracks petered out. At one point we strayed across a section that must have once been a fast flowing watercourse as it was strewn with suitcase size boulders. It was a bad move as the bikes took a pounding and damaging a crankcase or bending a wheel out here would have been game over. We made it through on to a flatter section but then Charlie found that he’d lost first and second gear. Bearing in mind Oz’s toolkit disaster and the fact we hadn’t seen fit to buy any tools in Zagora, stripping the gearbox was not an option. To our immense relief it turned out the gearbox was fine. Charlie had just twatted a rock and bent the gear lever so much that it didn’t have enough travel to actually change gear. With the aid of another rock we re-twatted the gear lever in the other direction. Fixed. Wipe brows. Carry on. One thing you can’t under-estimate is how much water you need. In Zagora we’d stocked up with as much water as we could carry. But we also needed spare fuel, and fuel and water is heavy so we were limited. Although we’d been advised not to drink the water, when we did come across a well we filled up. Better to have a dodgy tummy than die of thirst. We drenched our headscarves with water to bring some welcome relief from the heat and pushed on. By our reckoning we had about 70kms to do to reach our first planned stop. We weren’t aiming for anything in particular, we just knew we had to make that sort of distance to keep the schedule. Trouble was in the last two hours we’d done only 30kms, and we only had two hours of daylight left. We did get a good long stretch of hamada which enabled us to cruise for long periods at a mind-blowing 40 km/h. And then we reached that crossroads. “It’s definitely left. Or right”. We were too busy tucking into fried chicken to remember the instructions the locals gave us but we could all remember them saying one way was good and the other way was “very very not good“.